THE LATE Bafana Bafana legend Phil 'Chippa' Masingawill be given a provincial official funeral in Klerksdorp in the North West on Thursday, January 24. THE LATE Bafana Bafana legend Phil ‘Chippa’ Masingawill be given a provincial official funeral in Klerksdorp in the North West on Thursday, January 24. Glorious moments. 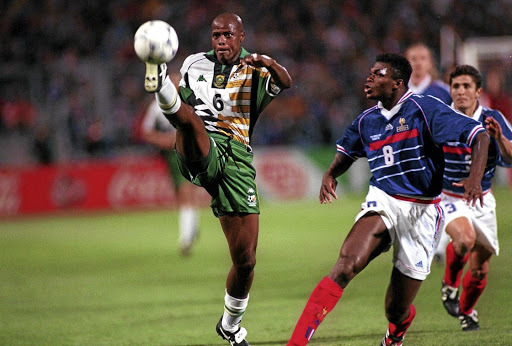 Phil ‘Chippa’ Masinga taking on former France defender Marcel Desailly. According to the Sowetan, the National Sports Ministry had put in the request to president Cyril Ramaphosa and the green light has reportedly been given. Sports Ministry spokesperson Vuyo Mhaga told the publication: “Yes the request has been received and we are actually processing that with the office of the premier in North West. “In no time we will be able to bring South Africans into our confidence that the request has been approved by the president. “The family has also indicated that a memorial service will be held in Johannesburg on Friday, January 18 and another one will be held in North West next Tuesday (January 22). The details of the venues will be communicated on Wednesday. Meanwhile, the president of the South African Masters and Legends Football Association (SAMLFA), Buddha Mathathe, added that the Klerksdorp Stadium was the striker’s wish for the venue. He said: “We had a meeting at SAFA House on Monday with the president of SAFA Danny Jordaan and government officials from the sport ministry. Ed Note: I came to know ‘Chippa’ whilst still playing for Jomo Cosmos way back. Always in the company of teammates Gesond Vilakazi, Eric September and Shakes Gwabeni, they would visit a well-known ‘inyanga’ in my neighbourhood Naledi-Soweto, who sadly passed-on. Where it all began. 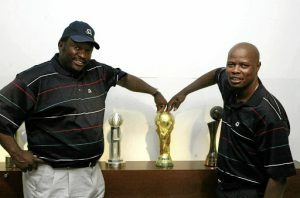 Chippa and mentor Ephraim ‘Jomo Matsilele- Black Prince of SA’ Sono, at the South Africa 2010 Bid Book Presentation to Fifa, Fifa House, Zurich have their hands on the World Cup Trophy in the display cabinet at FIFA House. in the backseat of their ‘Gusheshe’- BMW, the players were a hit with everyone, including yours truly at that young-age. But one thing for sure, they had no pride as they interacted with all and sundry- to such an extend recruiting some of the youngsters from Thomas Mofolo Secondary, Thabo High and the infamous Naledi High to join Cosmos. As Benny McCarthy retorted with a deep voice this week: “We’re all to blame, me included, for not checking up on our previous teammates, on how are they doing or what kind of help is needed. We’re cooked up in our busy schedules without checking up on each other. The emotional ‘Matsilele’ Jomo Sono asked “where are these boys rushing too, they’re supposed to bury me not the other way ’round?” in reference to another fallen star Sizwe Motaung. He played for Leeds United, Mamelodi Sundowns, Cosmos, St Gallen (Switzerland), Salernitana & Bari (Italy) and Al Wahda (UAE). The 49 year old died due to cancer. He lives a Son, fiance and family. The former Bafana striker scored 18 goals in 58 international matches between 1992 and 2001. Rest in Peace ‘Raul, Chippa’ Masinga- additional reporting Sydney Morweng, News Editor.